Any building that’s been hanging around for a 110 years or so is going to have a fascinating and varied history. The Old Vic, originally known as The Doak House is no exception. 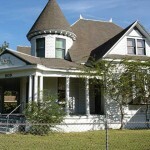 On this page we’ll link to articles about the home’s history as we discover it.